This is what Comme des Garçons used to be about. Before Dover Street Market welcomed the hypebeasts and people who only buy the wallets. 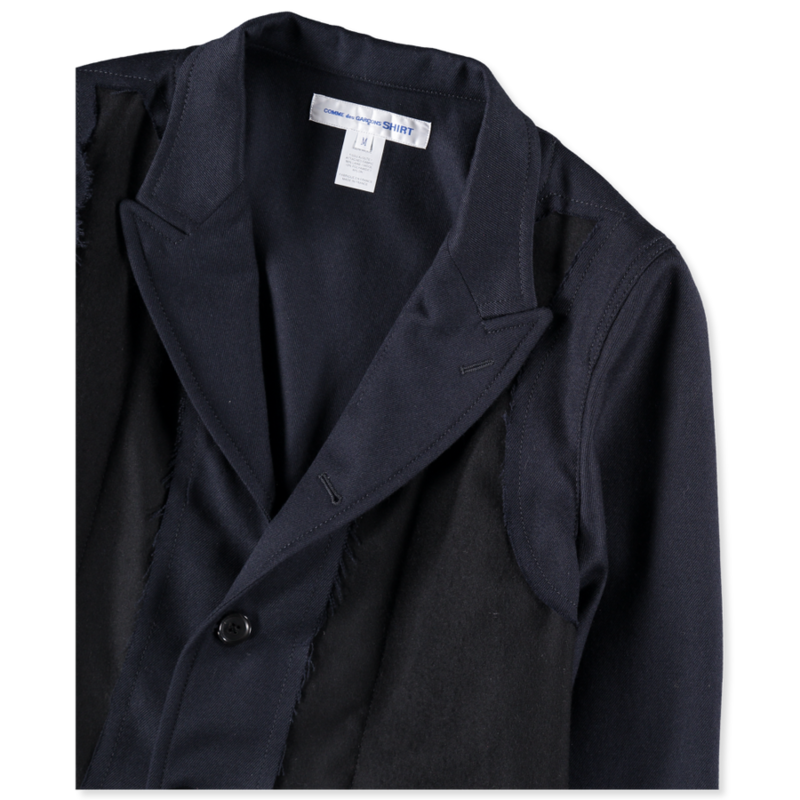 Before decades of questionable collaborations, countless fragrances and the ubiquity of PLAY Converse, this jacket is what Comme des Garçons was about. Inscrutable, proudly intellectual, and resolutely straight-faced, as it peddled its subversive mystique to successful creatives and oddball society grandmothers. Now that the new digital only CDG line is up and running – comprising yet more nylon bags, tees and coats covered in logos – this raw-edged, patchwork jacket feels especially relevant. If only to those nostalgic for the days of SIX magazine and incomprehensible adverts in The Face. And to anyone who remembers the old Comme shop on Brook Street; buzzing to get in, before shuffling around in silence. Your veneer of confidence, steadily eroding beneath the vampiric assistants’ terrifying gaze. 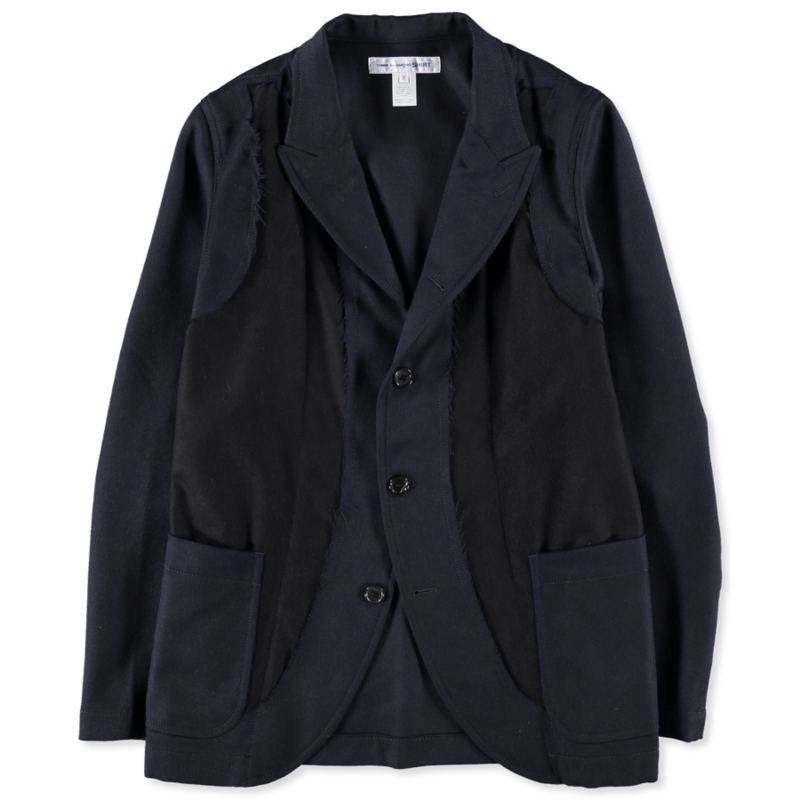 It’s not even as if this jacket is 100% Comme. It’s from the SHIRT line and consequently made in France rather than Japan. 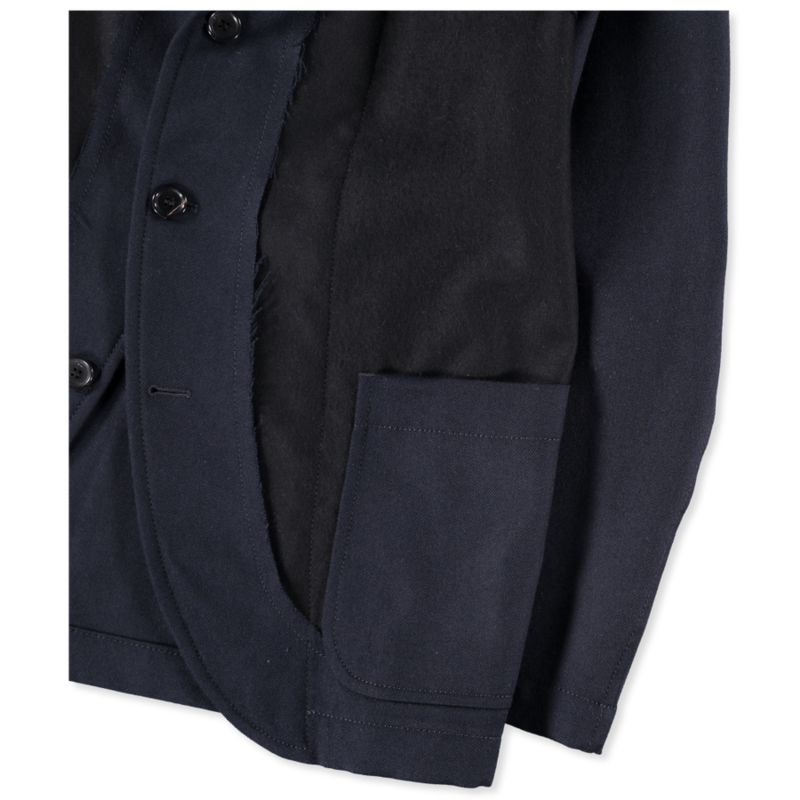 Still, it’s wool, it boasts a couple of pockets and a curvy hem with a four button fastening. 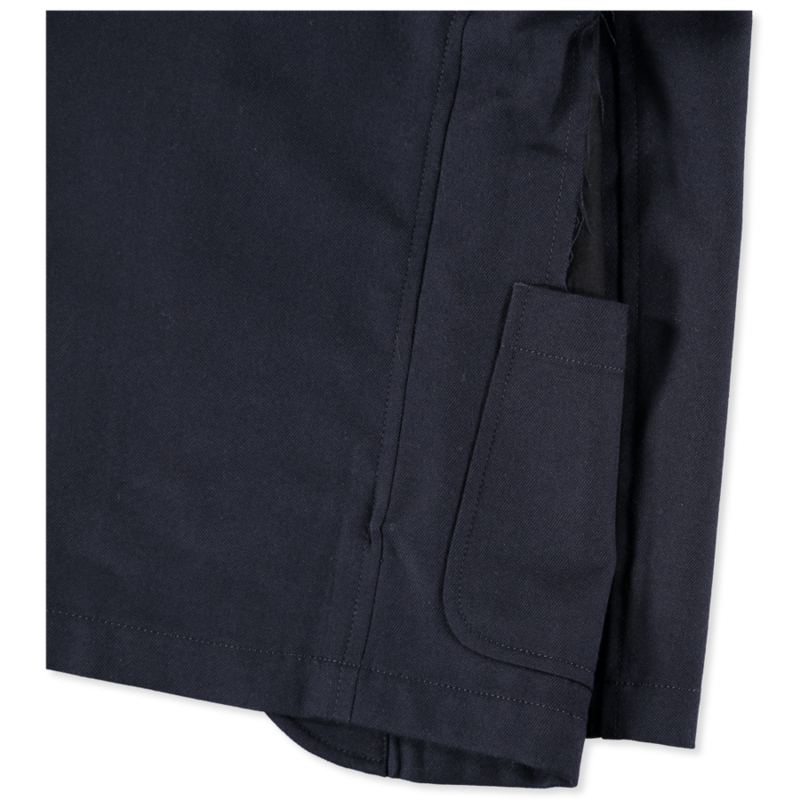 And crucially, what are referred to by retailer Nitty Gritty as, ‘navy inserts featuring raw edges’. It looks from the images as though the main jacket body is blue and the ‘inserts’ are black. Maybe they could be dark navy? 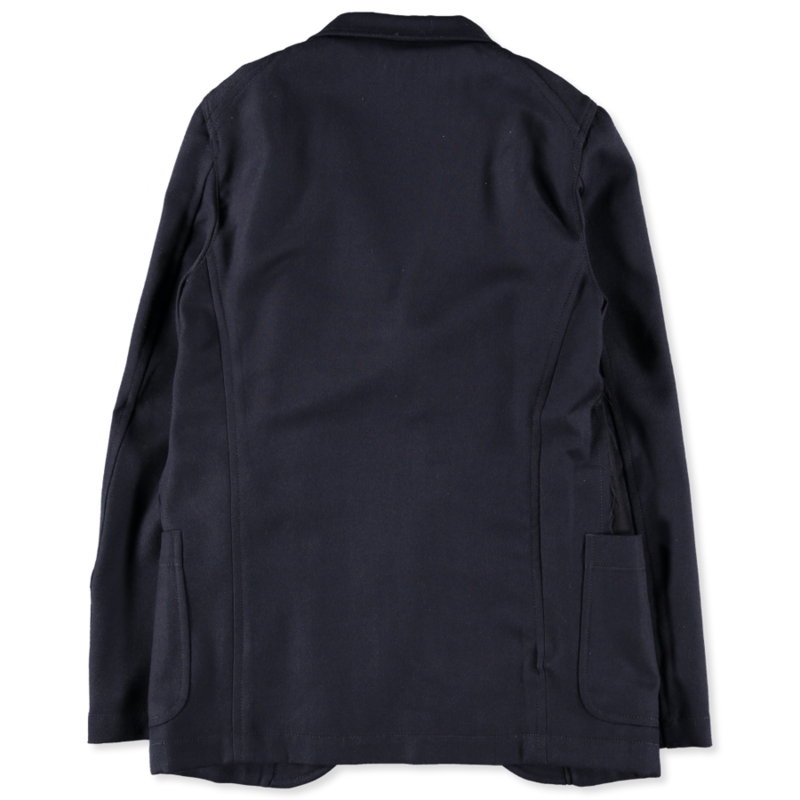 Either way, what you’ve got here is a jacket that in today’s climate looks relatively placid. But one that if worn back in 1987 in Soho, would have made you inappropriately cool. I can’t imagine it’ll be of much interest to the A$AP generation. But old school desgarçonsphiles – a term I’ve fashioned entirely for this sentence – may fancy copping this woollen reminiscence. There’s still a power to this stuff. In certain circles, even just tossed over a plain tee, it’ll boost perception of your intellect, taste and cultural understanding. At least I assume it will. I don’t move in those circles. Do those circles even exist anymore? Maybe I’m just blindly romanticising this contemporary artefact. The days of Arena magazine, the Kamen brothers shot by Ray Petri and Japanese anti-fashion are long gone. Perhaps the soul of Comme, that which made it remarkable, is gone too? Perhaps all that’s left is this vaguely unusual jacket made of wool.